Installers have been given a ground-breaking new way to specify designer radiators thanks to the launch of an industry-first augmented reality app by Barlo Radiators. 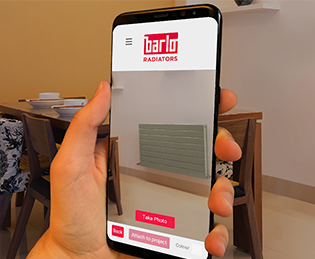 The newly launched Barlo Designer Radiator app, gives consumers the opportunity to virtually ‘try before they buy’ – using advanced augmented reality (AR) technology to help them visualise how different designer radiators would appear, in situ, in their home. The app has been created specifically with installers in mind, presenting them with a brand-new sales tool to help them add value when communicating with customers. As the industry’s first AR radiator app, it gives installers and homeowners an unprecedented, no-obligation look into how designer radiators can transform a specific space. Through its simple and intuitive design, installers can access Barlo’s designer radiator range at the touch of a button, and show customers how multiple styles, sizes and colours could impact on the aesthetic of their rooms. Richard Wheeler, Product Strategy Manager at Barlo Radiators, said: “Designer radiators are an easy and cost-effective way to inject colour, style and character to any space, and here at Barlo we’re seeing a growing trend in consumers looking into designer heating options for their homes. As the industry becomes more design-focused, it’s vital that installers and their customers choose products that not only look impressive, but deliver on functionality and performance too – and our Barlo Designer Radiator app has been created to help them do just that. Available for download on both Android and iOS devices, the Barlo Designer Radiator app gives installers easy access to the Barlo Design portfolio, including its popular Slieve, Adagio, Forza and Plaza designs. Users can simply point their device’s camera at their chosen wall space and the app will use pioneering AR functionality to display a fully scaled, 3D mounted image of their selected Barlo radiator. They can then choose different designs, sizes and colours, before saving images and sharing them directly via the app. As well as creating AR visuals, installers can use the app to send quotes to customers quickly and efficiently with the ability to include their business’s logo. It also features a heat loss calculator (allowing installers to quickly calculate a room’s BTU requirement), as well as a store locator, with information on where they can find their nearest Barlo radiator stockist. The Barlo Designer Radiator app is now live on the App Store and Google Play store. Installers can request a starter pack through the app (providing access to a Barlo AR wall marker tool for enhanced sizing accuracy) or by contacting Barlo Radiators on 01633 657 000 or by visiting barlo.co.uk/app.